100 Happiness Quotes – All in One Place. Read and Be Happy! Image by D. Sharon Pruitt (license). 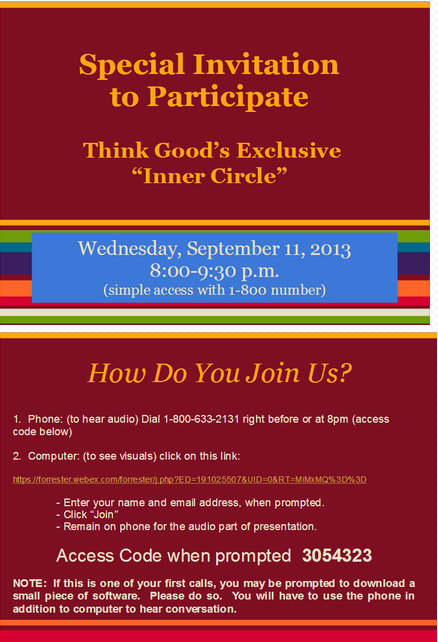 Would You Like to Be a Part of a Social Good Company’s “Inner Circle”? Happy September! What a great time of the year. The season of smells and football. Wet leaves, warm hot chocolate, apple pies, pumpkin carvings, apple picking, and homemade soups. And with it, warm bright earthy tones, warm fires and rosy cheeks. For us at Think Good, it marks our Sixth Month Anniversary. We have lots to celebrate including getting to know many of you. We’ve gone through many whiteboard markers, erasers, ink, business plans, LOTS of quotes, monetization plans, and various strategies for plans B, C, D and yes, even E, F and G.
As we have shared from the beginning, we are building this company with modern, yet proven business philosophies – working with YOU as our expert. This exclusive group we call “The Inner Circle” contributes their thoughts and ideas and becomes a part of the overall process. During these calls Think Good’s senior leadership, Ann-Marie Bland and Jeff Ernst joined by the rest of the team will explain Think Good, company objectives, the excitement and groundswell that’s building, and how you can participate. All attendees will leave with an understanding of Think Good’s movement and knowledge about “what’s under the hood” (it’s much bigger and exciting than we have announced – – in fact, we haven’t formally announced anything!). We will share our plans beyond the Facebook page (we are much more than that) and where we’d like to take the company with your input. The minimum requirement to participate on this Advisory Board is regular participation in Wednesday evening calls, completion of three or so surveys, and quotes and endorsements to be used on the website and marketing materials. The maximum participation is open ended. For those that want to be active, we certainly could use the help. To participate on the calls, it’s as simple as dialing a toll free phone number and clicking a link. Just sit back, watch, listen and more importantly TELL US WHAT YOU THINK. We are looking to bring “100 In The Know” members into the fold – as part of our advisory group. The people that participate, like us at Think Good, have the potential to create something that does truthfully impact lives. Lives of potentially thousands, millions and even billions if we all push the message out. Anything is possible. The world wants positive energy and we can provide it. As a member, you will be given the red carpet treatment as our most important members of the team. 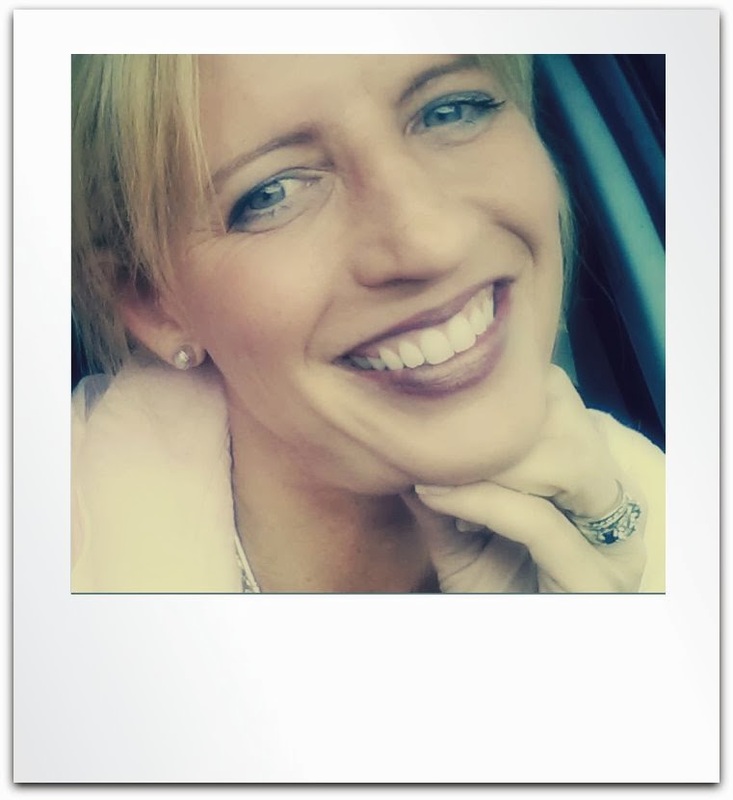 Virtual hugs, lots of laughs, precious moments, and an overall Feel GOOD feeling. We are a startup and make the experience fun and rewarding as crazy as it is. Through social media, our networks, coming together in a community where ideas can be shared and the message echo throughout; you can be the catalyst (an advanced and hopefully more successful “Telephone Game”.) If each of us throws a stone out in our part of the water, causing ripples that eventually blend into each other representing the like minded community that is living in harmony of people helping people. An exciting component to Think Good is the free exchange of information shared (causes, volunteers, donors, fundraisers) allowing all people wanting to help and the people in need of help, to tap into a community of like minded people, share best practices and other successful ideas. Think Good breaks down the silos and allows sharing of knowledge for over a million non-profits. 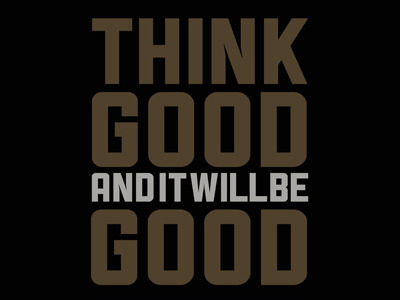 Think Good is a place to inspire, encourage, connect, and even witness the good happenings in the world, and at the end of the day, that’s what we are all here to do. Good. We have people working with Think Good from 4 time zones with a total of 16 people working on the project to some capacity. We are a completely virtual office and work through online tools, chat rooms and video conferences to keep us on the same page. TG is comprised of stay at home mom’s, new college grads, high school students, Think Good kids (the team’s kids), to corporate senior executives wanting to use their talents to give back. The current team has been responsible for building and successfully achieving financial goals for over 12 technology businesses and combined have over 150 years of entrepreneurial experience. High profile brands and companies under their leadership include NFL, Monopoly, NASCAR, Major League Baseball, Sony, Microsoft, Compaq to name only a few . Think Good is reaching approximately 60K-100K people per day in 18 different countries and 5 languages. Our totally community consists of approximately 6,000 members. The non-profit, NGO’s and private sector have historically been technically underserved causing antiquated processes and inefficiencies. The benefits technology could bring communication, management of help and helpers finding opportunities to give back are not always easy to find. A common place where everyone is working to better the world, can consult each other, or work together for a common cause, all in the best interest of those needing our help. Because of labor intensive methods and tireless fundraising and marketing efforts, many of these organizations are struggling. Think Good’s intends to build a community of “do gooders” (for lack of a better name), bringing together providers of help and those that are in need within the same community, brought together with technology. By bringing together these like minded, good hearted people under the umbrella of Think Good, we break down the walls, bring together the silos, get smarter and more efficient, increase the impact on social matters and engage more citizens in the act of helping people. Dream with us for just a minute: Imagine a world where people helping people is as part of a daily routines as brushing teeth. How cool is that? A world where people smile at each other, wave, people need people and when the interaction happens, people get out of solitude, out of our own minds – – – and feel better. Someday, we might be part of the reason for the increase of the well-being of society. We could not have said it better. If you are interested in participating, please fill out the form below and you will be sent instructions (or you can use the above message board). We look forward to being with you. In the meantime, don’t forget to: Think Good. Do Good. Feel Good. 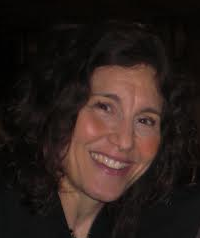 Tags: advocates for good, Ann-Marie Bland, Do Good, Feel Good, Jeff Ernst, Think Good! Happiness has many advantages. 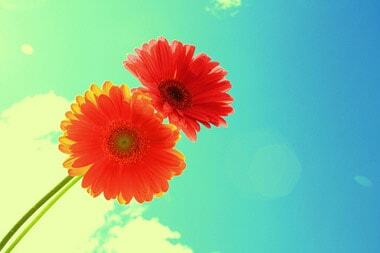 Happy individuals have healthier perspectives, less heart attacks, strokes and other ailments. They also have productivity advantages. 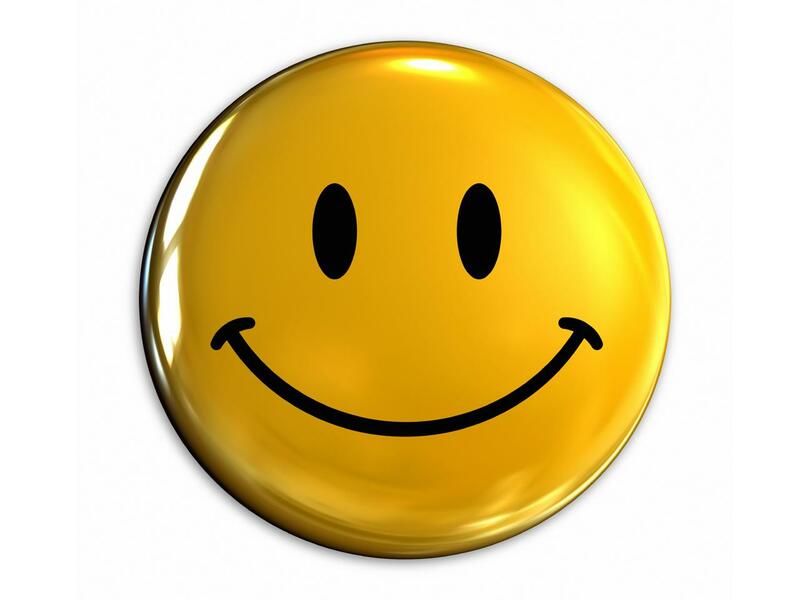 People who consider themselves happy show higher productivity and output. Tags: Do Good, Feel Good, happiness, Shawn Achor, TEDX, Think Good! One day the king and his friend were out on a hunting expedition. The friend would load and prepare the guns for the king. The friend had apparently done something wrong in preparing one of the guns, for after taking the gun from his friend, the king fired it and his thumb was blown off. Examining the situation the friend remarked as usual, “This is good!” To which the king replied, “No, this is NOT good!” and proceeded to send his friend to jail. About a year later, the king was hunting in an area that he should have known to stay clear of. Cannibals captured him and took him to their village. They tied his hands, stacked some wood, set up a stake and bound him to the stake. As they came near to set fire to the wood, they noticed that the king was missing a thumb. Being superstitious, they never ate anyone that was less than whole. So untying the king, they sent him on his way. “This is good?” he said to everything. 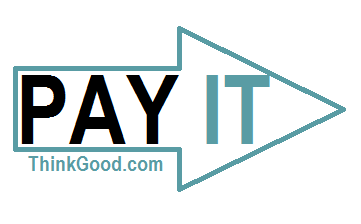 Tags: Do Good, Feel Good, inspirational, optimism, Think Good! Bringing a giraffe into the world is a tall order. A baby giraffe falls 10 feet from its mother’s womb and usually lands on its back. Within seconds it rolls over and tucks its legs under its body. From this position it considers the world for the first time and shakes off the last vestiges of the birthing fluid from its eyes and ears. 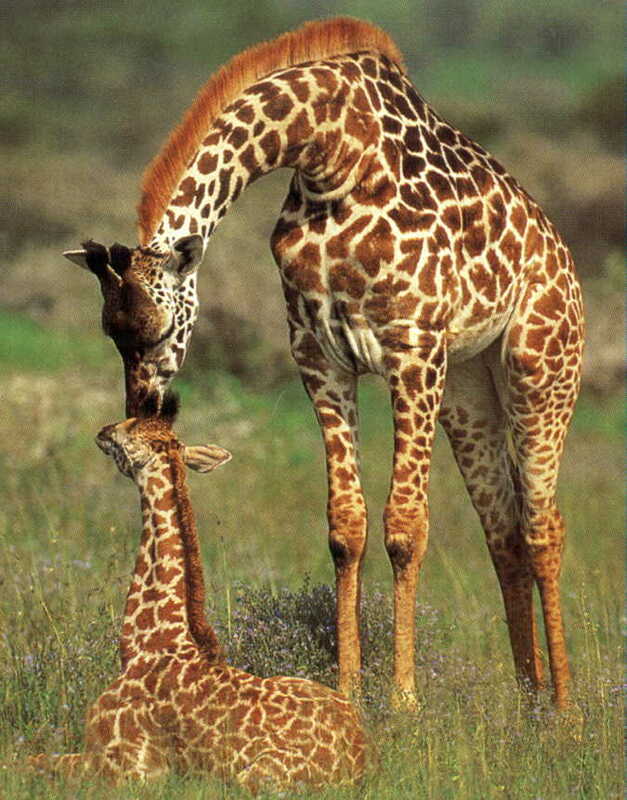 Then the mother giraffe rudely introduces its offspring to the reality of life. In his book, “A View from the Zoo”, Gary Richmond describes how a newborn giraffe learns its first lesson. The mother giraffe lowers her head long enough to take a quick look. Then she positions herself directly over her calf. She waits for about a minute, and then she does the most unreasonable thing. She swings her long, pendulous leg outward and kicks her baby, so that it is sent sprawling head over heels. When it doesn’t get up, the violent process is repeated over and over again. The struggle to rise is momentous. As the baby calf grows tired, the mother kicks it again to stimulate its efforts. Finally, the calf stands for the first time on its wobbly legs. 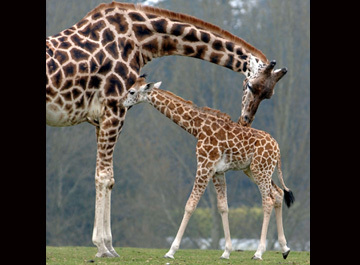 Then the mother giraffe does the most remarkable thing. She kicks it off its feet again. Why? She wants it to remember how it got up. In the wild, baby giraffes must be able to get up as quickly as possible to stay with the herd, where there is safety. Lions, hyenas, leopards, and wild hunting dogs all enjoy young giraffes, and they’d get it too, if the mother didn’t teach her calf to get up quickly and get with it. The late Irving Stone understood this. He spent a lifetime studying greatness, writing novelized biographies of such men as Michelangelo, Vincent van Gogh, Sigmund Freud, and Charles Darwin. Stone was once asked if he had found a thread that runs through the lives of all these exceptional people. He said, “I write about people who sometime in their life have a vision or dream of something that should be accomplished and they go to work. Tags: Do Good, Feel Good, Giraffe, giraffes, inspirational, Sigmund Freud, social-mission, Think Good! The book wasn’t very interesting, but between its pages there was something very interesting indeed. It was a thin strip of vellum on which was written the secret of the “Touchstone”! 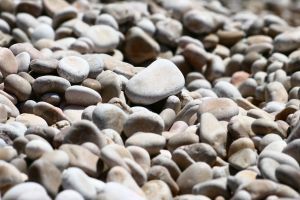 He knew that if he picked up ordinary pebbles and threw them down again because they were cold, he might pick up the same pebble hundreds of times. So, when he felt one that was cold, he threw it into the sea. He spent a whole day doing this but none of them was the touchstone. Yet he went on and on this way. Pick up a pebble. Cold – throw it into the sea. Pick up another. Throw it into the sea. The days stretched into weeks and the weeks into months. One day, however, about midafternoon, he picked up a pebble and it was warm. He threw it into the sea before he realized what he had done. He had formed such a strong habit of throwing each pebble into the sea that when the one he wanted came along, he still threw it away. So it is with opportunity. Unless we are vigilant, it’s asy to fail to recognize an opportunity when it is in hand and it’s just as easy to throw it away. Tags: Do Good, Feel Good, opportunities, short story, Think Good! A man stopped at a flower shop to order some flowers to be wired to his mother who lived two hundred miles away. Earth’s little reminders happen at the right times and can be a way to realign thinking.